Professor Bruce Bugbee, who specializes in the use of controlled environments to study crop growth and yield, leads the research project. Bugbee obtained permits to grow hemp from the Utah Department of Agriculture and Food and began the studies under LED lights in controlled chambers in February. Rooted hemp cuttings of federally approved low-tetrahydrocannabinol (THC, less than 0.3%) cultivars of Cannabis sativa were provided by growers in Colorado and Kentucky. Pineae Greenhouses in Ogden, Utah, has provided growing media and additional support for the research. 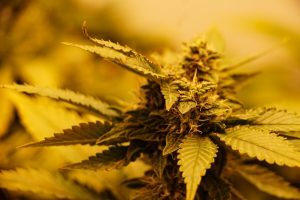 Bugbee explained that there are multiple goals for the research, but the primary focus is on the genetics and environmental conditions that produce cannabis flowers with high cannabidiol (CBD) and very low THC content. The Farm Bill defines hemp as cannabis that has less than 0.3 percent THC, the psychoactive compound that makes people intoxicated. It is not possible to become intoxicated from the hemp/cannabis cultivars being used in this research, Bugbee added. Changes in state and federal laws that have legalized the cultivation of hemp/cannabis for CBD oil production provide opportunities for Utah farmers and growers. 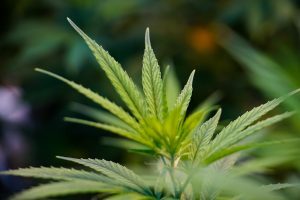 But because growing hemp/cannabis has been illegal in the U.S. for several decades, it has been difficult for plant scientists to conduct research. Bugbee said there are numerous claims about how to grow hemp/cannabis, but few scientific studies have been conducted in the United States. White said that, for at least the past two sessions of the Utah Legislature, some lawmakers have questioned whether CBD oil is truly effective, and he is glad the state’s leading research universities are working to provide answers. “This establishes an opportunity for us to study the physiology and genetics of the plants and allows the products to be pharmaceutically evaluated in university research laboratories,” White said. Bugbee pointed out that many important pharmaceuticals have been derived from plants, and there is potential for this research to produce a new class of botanical medicines. Based on this emerging research, he was recently invited to speak at a national conference on hemp/cannabis. 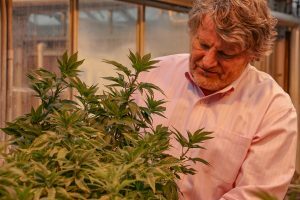 Flowers, leaves and stems will be harvested at regular intervals, and Professor Bill Doucette, an environmental chemist in USU’s Department of Civil and Environmental Engineering, will extract and analyze the tissues to characterize the cannabinoids. “A central goal is to determine the effect of plant growth stage and environmental conditions on CBD and THC concentrations,” Doucette said. Doucette and Bugbee have previously worked with federal and state agencies and private companies to study the use of plants to remove organic compounds from contaminated soils. This research builds on their ongoing collaborative studies. USU will optimize the growth of the plants, extract and characterize the cannabinoids and make CBD oil. Then the research will move to the University of Utah’s School of Pharmacology. Professor Karen Wilcox, chair of the University of Utah’s Department of Pharmacology and Toxicology, is exploring collaborations with Bugbee and Doucette on the project. Wilcox and others in the department already study cannabinoids and are accustomed to protocols for working with compounds from hemp/cannabis.